7 Growing Tips for your Herb Garden Plants. 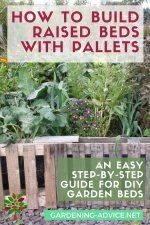 How to grow a kitchen herb garden with all the important care and maintenance tips you will need. 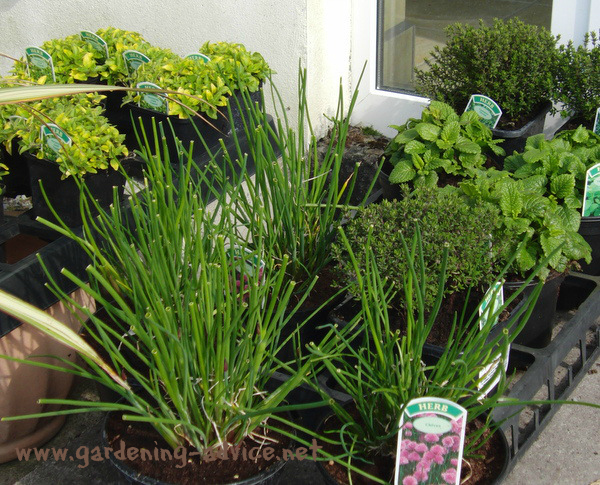 Growing herbs for a kitchen herb garden can be great fun. Particularly if you enjoy cooking with fresh herbs from your own garden. 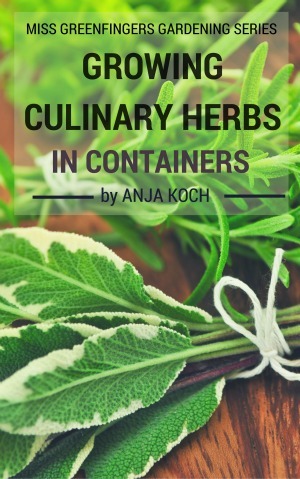 You just get the best flavor out of herbs if you can use them as fresh as possible! 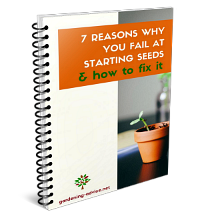 Often though I see people make the same mistakes when growing herb plants. 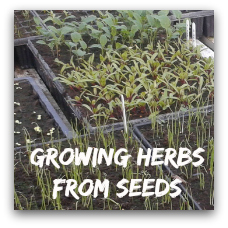 Growing herbs is fairly easy, you just have to remember where most these plants originally come from! A lot of herbs like rosemary, oregano, thyme and sage come from the Mediterranian. Knowing that makes it fairly obvious what conditions these herb plants need to thrive! Yes: a sunny spot, good drainage and a rather poor soil! 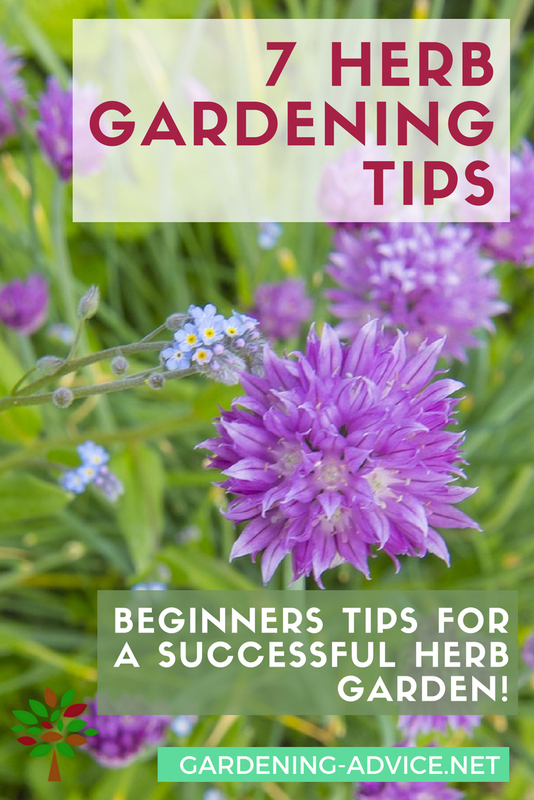 I gathered a few herb gardening tips for you. With these it should be no problem for you to get the best out of your herb garden plants. 1. 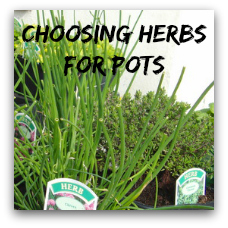 Choose healthy herb plants to start with! It could take you a long time to turn a sick plant into a productive, healthy herb plant. So it is much more successful to start off with a good quality plant. 2. Plant your herbs in the right spot! 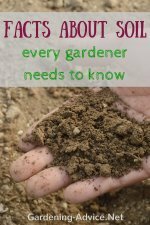 Do some research about the herb you are going to plant. What conditions do they like? 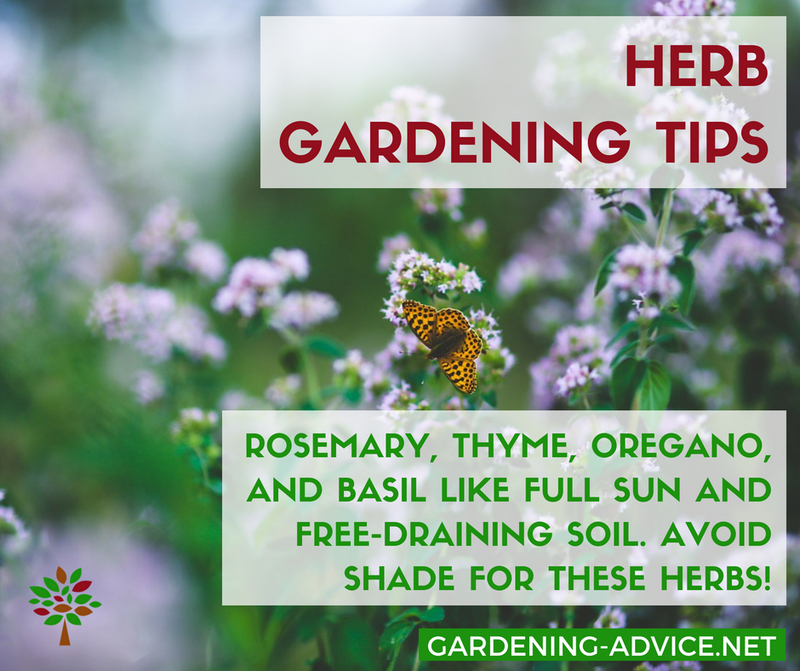 Most herbs thrive in a sunny spot with free draining soil. The soil can be on the poor side. Herbs like parsley can deal with semi-shaded positions. Herbs don't like to compete against weeds. 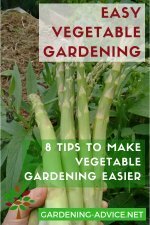 Regularly weeding helps to prevent herb plants to be crowded out by the faster growing weeds. 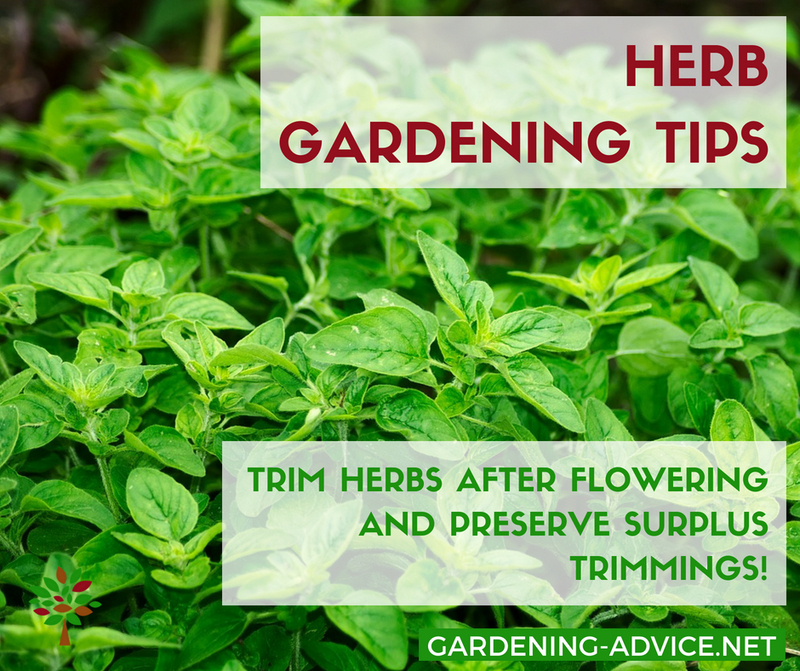 If you are not using your herb plants a lot they might benefit from a trim. The best time to do that is usually when the plants have finished flowering. It will help to keep the plants neat and bushy. It also prevents plants like lavender to become woody too quickly. Trim away about half of the new growth. Most herbs like thyme or lavender don't like to be trimmed back into the old wood. You can of course dry the trimmed off leaves and save them for a later use in the winter! 4. Don't overcrowd your herb garden! All plants need a bit of room to develop properly. Depending on the types of herbs they need more or less space. Also invasive herbs like mint should not be planted in an area where they can't be allowed to spread. Grow them in a container on their own instead or give them a corner in the garden where they can spread as they like. I often see people planting too many herbs into a container! A sage, rosemary, thyme plus a parsley plant will not grow together out of a 10 inch pot. This might look ok for a couple of month but is not enough room to keep them happy long term! Most herbs are fairly disease resistant and shouldn't need any chemicals or sprays. For most pests a bit of soapy water will do the job! Check this page for organic pest control methods. 6. Don't over-water your herbs! Most herbs like dry conditions. Of course they need water like other garden plants, but probably not as much! 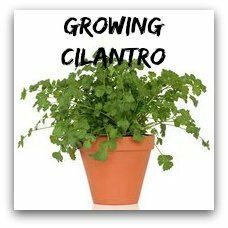 Keep an eye on herbs grown in containers. They of course need more regular watering than plants in the ground. Herbs need less feeding than most other plants. This does not mean though that you can completely forget about it! Use an organic fertilizer at about half the strength for feeding herb plants. 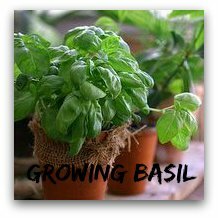 With these herb gardening tips should be able to grow great tasting herbs for your kitchen herb garden. You can dry or freeze surplus herbs and enjoy them during the winter months. They will bring back the warming flavor of summer and remind you of your beautiful kitchen herb garden!